Recently, the Colorado legislature passed, and their Governor signed, a law that authorizes the state to collect sales tax from Amazon, based on their Amazon Associates program. That is the program where bloggers have ads and links on their blogs, and if a click-through results in a sale, the blogger is paid a small commission. I haven’t had time to read all the analysis, but essentially the new law declares that the Amazon Associates establishes a business presence for Amazon in the state, making these sales subject to Colorado sales tax that Amazon would be required to collect. There is apparently a huge amount of red tape holding the whole thing together. Immediately, Amazon dropped all their Colorado Associates. Can you blame them? Why put your face intentionally in the way of a swinging fist when you can just leave and take your toys someplace where they place nicely? Also, how is the Amazon Associates program, which is essentially just an online advertisement, any different from, say, taking out a magazine or newspaper ad? If Amazon decided to take out an ad in The Denver Post, would that give them a business presence in Colorado? The very notion is absurd. How is a blog that happens to be written by someone who lives in Colorado any different? Now, the bloggers are fighting back. Notably, Diana Hsieh and Ari Armstrong, two leading Objectivist intellectuals/writers/activists, have taken up the cause. Ms. Hsieh has launched a website, Repeal The Amazon Tax, where they have begun a campaign to have the legislation overturned. There is also a Google Group that you can join to get updates on the campaign; Mr. Armstrong has been heading up that front. My hope is that they succeed. Why should I care, sitting here at home in Los Angeles? What dog do I have in this race? Through it all, the voice in my head has been getting louder, asking with all seriousness: do I really want to stay in California, if this is going to be how it's going to be? But then, is it really going to be any better anywhere else? Should I stay and fight? But that is a another question for another time. The issue at hand for today is: Can a small group of dedicated, principled, freedom-fighting Coloradans defeat this tax? If so, then I might feel like there’s some hope for the rest of us. or, at least, this blogger is. I remember, as a small child (first or second grade-ish), wanting to be very creative when I grew up. When I was around 12, I decided I wanted to be an architect. Next week I am taking the final of 10 exams required to be a licensed architect in California, and I have completed all the other requirements as well, so I am really close! I have to go get back to my studying now. As I said, I had only been half-listening, (maybe even only one-third-listening,) and the news broadcast switched to another subject after the quote ended. Still, it didn’t take any effort at all for the news junkie in me to realize that he was talking about his latest efforts to get Congress to pass his healthcare legislation. I wanted to jump up and point at the radio and shout “You Lie!” but since I was driving and it was raining, and driving in the rain in L.A. is pretty much like driving in an ice storm anywhere else in the country, I couldn’t really jump up and level my accusation. Come on people, let’s do a little reality check here. Is there not already a MASSIVE FEDERAL BUREAUCRACY and ENDLESS REGULATORY RED TAPE bogging down our healthcare system (and getting right in the way of a family and its doctor?) For the President to make this particular statement, on this subject, in the context of what he is trying to do with healthcare in America, is utterly outrageous. You can see it on YouTube here and if you scroll to 2:57 you will get the quote. It is preceded by a pretty standard rant against the evil insurance companies, which of course completely drops the context of all the regulation that has them boxed into the dreadful state they are in these days. Back when my Mom was still working as a nurse (Hi Mom!) I remember how shocked I was to learn that it was about a third of the man-hours of a doctor’s office that was given to regulatory compliance. I’m sure it’s much higher now, probably close to half (or more?) as that was probably about a decade ago. Do we really need more of this? How much red tape is enough? Is there EVER enough? The answer (from those holding the tape dispensors) is: Clearly Not! The problem with red tape is that the more of it you have, the more you need, to try to fix the unexpected problems that inevitably spring up as a result of the red tape applied to the problem in the first place. The red tape must be unraveled, not augmented. And, there are so, so, so many good ideas out there for reforming the system, from tort reform, to reducing mandates and allowing interstate insurance competition, and encouraging those medical savings accounts, and many others, that there’s really no excuse for pretending that expanding the existing MASSIVE FEDERAL BUREAUCRACY and ENDLESS REGULATORY RED TAPE is the way out of this mess. (Yes, I realize that if the RRT is really ‘endless’ then it is a logical contradiction to characterize it as ‘expandable’ but there are far worse contradictions at work in the halls of Congress, and believe you me, they will find a way to do it.) And if you think this bill will somehow streamline things or pay for itself with its own efficiencies or some such nonsense, you are living in Fantasy Land. I also fully realize that the kind of contradictory double-speak exhibited by President Barama in this example is the norm these days, and it practically comes out of just about every politician’s mouth all the time, but he is the President after all, and as such it makes him a pretty clear target for criticism. In addition to running a household with a husband and 3 kids, she also has a nice little business dyeing sock yarn, which she sells at her Etsy shop. Not just any old sock yarn, but amazingly beautiful sock yarn, called Sophie's Toes Delicious Sock Yarn. It is, in fact, delicious. As you might imagine, she is also quite expert at knitting socks. I have tried knitting socks and just don't have the knack for it. I have made a grand total of 3 1/2 socks and don't really have the desire to make any more of them. This is a shame since I enjoy knitting and have a really great source for some of the best sock yarn ever. 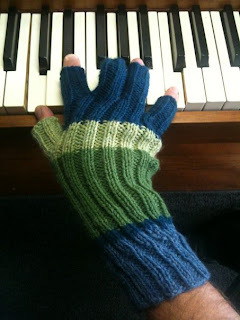 At long last, I think I have discovered a workaround for this problem: Gloves! Some knitters really get into making socks. I'm not sure why I don't like making them. 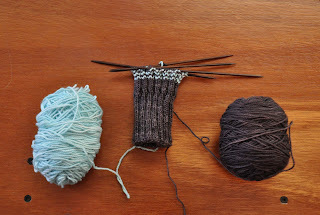 For the most part, socks are relatively simple in construction, although the heel can be tricky. Hand-knit socks are really wonderful-feeling on the feet. 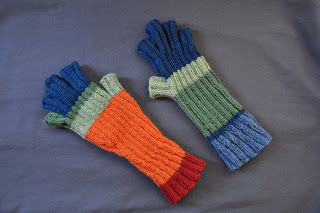 Gloves, it would seem, with all those fussy little individual fingers to knit, would be a pain and take forever to make. 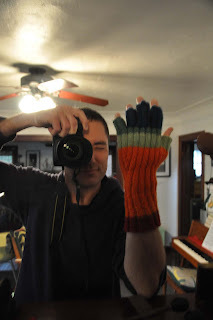 Yet, as much as I dislike making socks, I love making gloves! I think one of the main things I enjoy about making a glove is studying the geometry of its construction, and fitting the glove to the hand. In the end, I guess I'm just more into hands than I am into feet. Glove 1.1 actually started life as the beginning of a sock. I started it as my first foray into sock knitting, and my first try at knitting on dpn's (double-pointed needles, for you non-knitters.) I started it years ago and promptly lost interest. Then I picked it up again last summer, when I was between projects, and started adding more colors. This made it a little more interesting to work on, and I made progress. 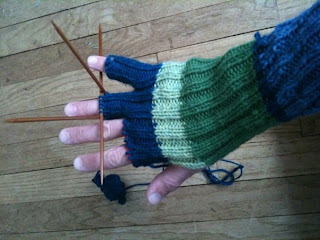 I think I was somewhere in the dark green section when I decided to try making it a glove instead. Glove 1.1 in C minor. 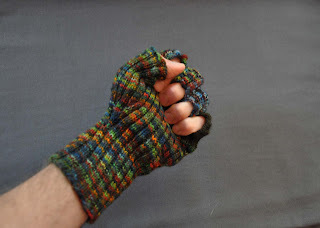 The construction of this glove is pretty crude: It is basically a tube of 2x2 rib divided up into fingers at the end, with a simple tube knit perpendicular to the hand, for the thumb. 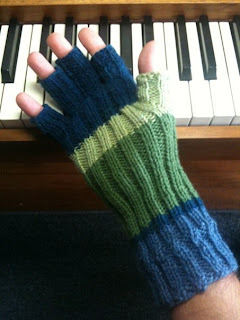 I left the opening for the thumb as I worked my way towards the fingers, and then came back and knit it later. Glove 1.1. Note how the thumb looks 'stuck on'. For Glove 1.2, I improved the shape by increasing the number of stitches into a series of V's along the thumb and little finger. I had never done this kind of increase before but I just made it up as I went along. It worked relatively well. It's hard to take your own picture of your own hand. 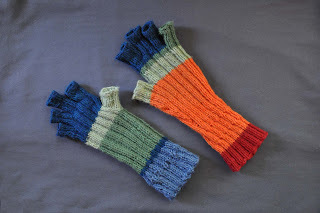 These were knit using Cascade 220, one of my favorite yarns, on size 4 needles. I have a fair amount of Cascade left over from some scarves and experiments with felting that I did when I first learned to knit. Even though they don't completely match, they share some of the same colors, and they fit about the same, so I consider these two to be a set, even if they aren't strictly a pair. After these two, I decided to dig into some remnants of Sophie's Toes that Emily had given me. Since her yarn is a much thinner strand than the Cascade 220, I had to adjust the pattern from worsted weight and #4 needles to sock weight and #2 needles. I started Glove 2.1 while I was in Tennessee last month, and used the plane ride back to L.A. to work out the increase at the wrist and write it out as I went, so that I could repeat it accurately for Glove 2.2. 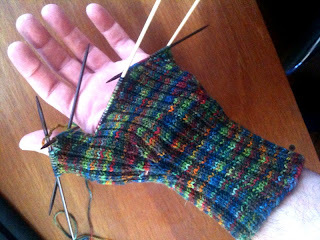 Here is Glove 2.1 in progress. Doesn't that Sophie's Toes just look delicious?! This colorway is called American Patchwork. All her colorways have great names. In-progress, on the needles, taken 2/10/10. See how the thumb shape is integrated into the hand? Big improvement over Glove 1.1. After working the thumb I decided to add an accent color, because I liked the blocks of color from the first two gloves. Can I get a big hand for Glove 2.1?! Perhaps I should incorporate brass reinforcements at the knuckles! Also, notice how the middle and ring fingers are slightly more blue than the rest? I ran out of American Patchwork and had to substitute with another color. It isn't really very noticeable. I showed it to my best friend, Deb. She works as a costumer and has a fierce eye for color. She zeroed right in on it. "It looks nice. How come those fingers are a different color?" 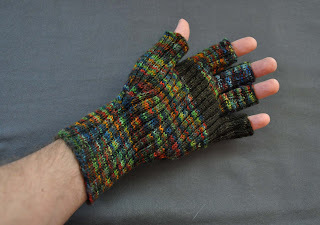 After reviewing Glove 2.1, there will be still a few more mods before I consider the pattern to be perfected. Namely: figuring out the finger division. Thus far I have had a hard time dividing the hand stitches among the 4 fingers, because a) I always want the rib pattern to relate visually to the fingers in an elegant way, 2) thus far I haven't really worked out the finger stitch division in advance, I have waited until I got there to figure it out, and 3) you can't just divide by 4 and call it a day, because the pinkie and index fingers, each being on the outside, use up more stitches. It seems like you would be able to, but it doesn't work. Now I have started Glove 2.2. All three of its predecessors have been slightly loose-fitting in various ways, so I am starting with 56 stitches around as opposed to 72. This will knit up much quicker. 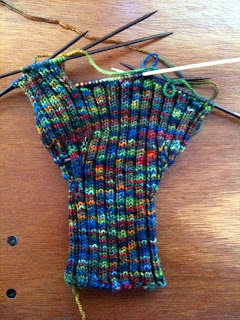 Glove 2.2 in progress: Koigu just isn't as much fun as Sophie's Toes. But, I am running low on Sophies Toes, so I started it using another sock yarn. Big mistake, it hasn't been nearly as much fun. I tried to liven it up by introducing a contrasting stripe, but it's not really helping, and I don't like how it looks. So, I will probably frog it and start over.